Trauma is a leading cause of traumatic brain injury (TBI) and must be considered by attorneys in the evaluation of all personal injury cases. Annually, an estimated 1.7 million traumatic brain injuries occur in the United States, resulting in an estimated52,000 fatalities, 275,000 hospitalizations and 1.365 millionindividuals being treated and released from emergency departments, according to the Centers for Disease Control(CDC). The leading causes of brain injury, in descending order, are falls(35.2 percent); motor vehicle accidents (17.3 percent); other forms of head contact (16.5 percent); and assaults (10 percent).Falls trigger half (50 percent) of the TBIs among children aged 0to 14 years and 61 percent of all TBIs among adults aged 65 years and older. Motor vehicle crashes and traffic-related incidents are the second leading cause of TBI (17.3 percent) and result in the largest percentage of TBI-related deaths (31.8percent) across all populations. The CDC estimates that about 75 percent of TBIs are concussions or other mild TBI. This article is intended to present an overview of the unique forensic considerations in evaluating, prosecuting or defending a claim of traumatic brain injury. It explores the multi-faceted and distinctive issues that confront legal practitioners in TB Ilitigation. The signs and symptoms of “mild” traumatic brain injury are subtle and therefore are frequently overlooked by medical personnel in busy emergency departments. Moreover, they are not immediately perceived by victims of brain trauma or family members. Consequently, an attorney performing an in-depth client consultation may be the first person to suspect a brain injury during the course of a comprehensive interview. Although the physical and neuropsychological injuries following moderate and severe traumatic brain injury may be easily identified, the same is not true for “mild” brain injuries. Careful and thorough screening by an attorney, whenever a client has sustained any type of head trauma, may reveal unrecognized and untreated injuries. Certain symptoms and complaints by potential clients regarding: headaches, dizziness, difficulty focusing, sensitivity to bright light or loud noise, short-term memory problems, difficulties concentrating or multitasking, irritability and unusual emotional reactions all oblige an attorney to investigate a possible brain injury. Although the signs and symptoms of some brain injuries may be subtle, there is nothing mild about a mild traumatic brain injury. Lawyers must recognize that the term “mild” is a misnomer. Serious, permanent physical, emotional and behavioral consequences can result following even a “mild” brain injury. A “mild” brain injury, sometimes referred to as a “concussion,” may precipitate serious medical issues. Identifying the occurrence of a concussion is often difficult because the signs and symptoms associated with this condition are elusive, idiosyncratic and last for varying durations. Many attorneys and insurance claims examiners mistakenly believe that a concussion requires a loss of consciousness. For more than 40 years, the Congress of Neurological Surgery has recognized that an individual may sustain a concussion without losing consciousness.1 The two most widely accepted concussion definitions, adopted by the Congress of Rehabilitation Medicine and the Centers for Disease Control (CDC), require only that the patient have some alteration of mental status(being dazed or confused) following the traumatic event. Shockingly enough, many individuals are never seen in a hospital emergency department following a mild brain injury. It is critical that attorneys interview not only liability witnesses at the scene of an accident, but they must carefully interview witnesses and first responders as to observations of the injured individual immediately and shortly after the accident for any complaints or unusual behavior. Observations such as confusion, disorientation, or being dazed are rarely reduced to writing. It is imperative that the notes of any first responders (police officers, fire department personnel, and ambulance attendants)be thoroughly reviewed, along with the full ambulance and emergency records. There are many indicia of concussions contained within these records, such as headache, nausea, vomiting, sensitivity to light or sound, sluggishness or feeling tired, even if the diagnosis is not written in the record itself. Other important medical notations are black eyes (“raccoon eyes”) “diagnostic for basal skull fracture,” or black and blue marks around the back of the neck (“battle’s sign”) indicative of a fracture of the base of the skull. At trial, an attorney must clearly explain the mechanism of brain trauma to a jury. The skull does not provide an adequate protective barrier shielding the brain from outside forces, in direct conflict with popular belief. The brain is a soft gelatinous structure that floats in the skull in a sea of cerebrospinal fluid. Though the skull is strong and hard, the inside is lined with many sharp ridges and edges which can cause damage to the vulnerable brain tissue. The brain is easily damaged moving within the skull cavity and violently striking these sharp areas inside the skull, both at the site of impact as well as the area directly opposite. When outside forces cause the brain to move forward, backward or rotate in the closed skull cavity, it is forcefully propelled against the sharp edges and protrusions inside the skull causing bruising, bleeding and destruction of nerve cells. After contact, transmitted forces cause damage and injury to the brain’s nerve fibers. Initially, the contact between the brain and skull causes a “coup injury.” Upon rebound, the brain strikes the skull on the opposite side causing a secondary “contra coup injury.” The well-established physics principle that a body in motion stays in motion, applies to the brain, and explains the mechanism of brain injury in an accident. Unfortunately, many of the cognitive signs and symptoms of a concussion such as memory loss, impaired concentration anddifficulties in multi-tasking, may not become apparent to the victim until after he/she has left the emergency department andreturned home. An individual’s attempted return to the routine tasks of schoolwork or employment often reveals the firstappearance of symptoms. Seeking out teachers, co-workers and employers as witnesses to compare the pre-accident performance and behavior of an individual, to post-accident functioning provides a treasure trove of invaluable information and evidence for an attorney litigating a mild brain injury case. An injured individual may not be able to discern his or her own behavioral changes and emotional reactions, nor may medical personnel unfamiliar with the individual’s pre-injury personality. Verbal and physical aggression, impulsivity, social dis-inhibition, altered emotional control, depression, and anxiety are often only recognized by spouses, parents, teachers, and co-workers. A defendant’s forensic examinations of individuals claiming a TBI disability frequently include accusations of malingering, exaggeration and secondary gain. These labels are most frequent in cases of mild traumatic brain injury, and are tantamount to accusing the plaintiff of fabricating his or her claim. Malingering tests fall into the general categories of effort/concentration skills, and symptom exaggeration. The Test of Memory Malingering (TOMM) and the Rey 15 item test are the most widely utilized assessments of effort and concentration and are essentially memory/recall tests, where pictures, numbers and shapes must be remembered and recalled. A substandard score is ostensibly correlated with a lack of effort. Similarly, symptom exaggeration is purportedly tested through a subtest of the Minnesota Multiphasic Personality Inventory(MMPI-2) known as the Fake Bad Scale (FBS). The scale consists of 43 questions used in the personality inventory. If the patient endorses a significant number of somatic complaints, such as, “Much of the time my head seems to hurt all over”; sleep disturbance complaints, such as, “my sleep is fitful and disturbed”; tension or stress complaints, such as, “I find it hard to keep my mind on a task or job”; and categories of low energy and deviant attitudes or behaviors, the individual is classified as engaging in symptom exaggeration. The suggestion of intentional falsehood and perhaps even perjury must be approached with extreme caution. Malingering is the “intentional production of false or grossly exaggerated physical or psychological symptoms motivated by externalincentives.”7 A battery of “tests,” purportedly formulated to distinguish the malingerer from the legitimately injuredindividual, implicitly assumes that a test can differentiate between a brain-injured person and one feigning appropriatesymptoms and complaints. This supposition ignores fundamental truths inherent in traumatic brain injury victims. Can a lack of motivation test distinguish intentional malingering from the effects of traumatic brain damage itself? Should failing the test be attributed to chronic pain and depression, or intentional falsehoods propounded by the test taker? The conclusion that one failed to use his or her best effort on these tests accepts the premise that a brain-injured individual has the capacity to apply best efforts consistently. Further, the conclusion of malingering presupposes that a brain-injured person cannot fail the exam, regardless of score, as there is no way to accurately quantify what percentage or portion of the injured victim’s courtroom testimony is true or false. Test performance below recommended cutoffs is not a sine qua non indicator of malingering.8 The admissibility of these conclusions is frequently a subject of Daubert and Frye challenges. 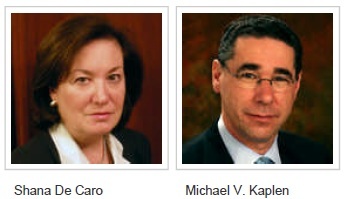 Shana De Caro and Michael V. Kaplen are partners at De Caro & Kaplen in Pleasantville. Ms. De Caro is secretary of theCivil Justice Foundation, and Mr. Kaplen is the chair of the New York State Traumatic Brain Injury Services Coordinating Council. 1. Neurology, March 1997, Kelly & Rosenberg. 2. Zassler, Katz & Zafonte, Brain Injury Medicine, p. 144, Demos Press, 2007. 3. Yudofsky & Hales, American Psychiatric Publishing, Textbook of Neuropsychiatry and Clinical Neurosciences, AmericanPsychiatric Publishing, 4th edition, 2002. 4. American Academy of Neurology, Assessment: Neuropsychological Testing of Adults, Neurology, 47: 592-599,1996. 5. Adamson v. Chiovaro, 308 N.J. Super 70 (1998). 6. Brown v. Allerton Associates, 13 Misc.3d 1232A, 831 NYS2d 351; LaMasa v. Bachman, 56 AD3d 340, 869 NYS2d 17 (1stDept. 2008). 7. American Psychiatric Association, DSM IV-R, Diagnostic and Statistical Manual of Mental Disorders, 2000, p. 739. 8. Herman S. Report of the therapeutics and technology assessment subcommittee of the American Academy of Neurology,Neurology, 1996;47; 592-9. 9. People v. Angelo, 88 NY2d 217, 644 NYS2d 460; People v. Scott, 88 NY2d 888, 644 NYS2d 913; Prince, Richardson onEvidence, §7-323. 10. Silver & McAllister, “Forensic Issues in the Neuropsychiatric Evaluation of the Patient with Mild Traumatic Brain Injury,”Journal of Neuropsychiatry, 1997. 11. Alexander, Neurology, July 1995.